Owing to its outstanding contribution in promoting plant growth and mitigating environmental stresses through activating different defense mechanisms, a root-colonizing endophytic fungus Piriformospora indica has received great attention from researchers over the past three decades. Piriformospora indica is a cultivable fungus which demonstrates its adaptability of colonizing a broad spectrum of plant species through secretion/alteration of secondary metabolites and host hormone signaling pathways during the course of root association. Association of Piriformospora indica with plant roots leads to an improved plant performance like proliferation by indole-3-acetic acid production and nutrient acquisition subsequently leading to improved crop growth and production. Furthermore, its metabolites reprogram the root association which stimulates both local and systemic resistance against plant diseases through signal transduction. 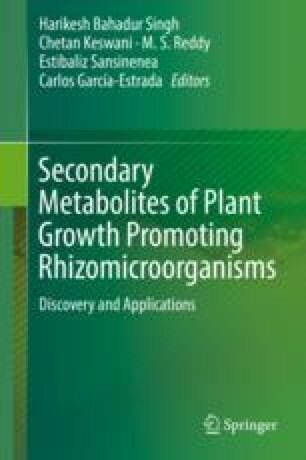 In this review, we focus on the importance of secondary metabolites of Piriformospora indica, limited not only in plants but also in animal system. Bansh Narayan Singh, Akash Hidangmayum, Ankita Singh, Shailendra Singh Shera and Padmanabh Dwivedi have been equally contributed to this chapter.